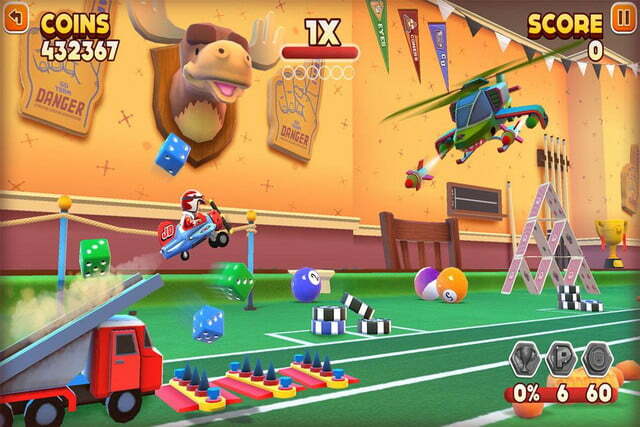 Hello Games build on the great ideas from 2013’s Joe Danger Touch in the iOS-only follow-up, Joe Danger Infinity. Hello Games took a break from mopping up the recent floodwaters that coursed through its Guildford, UK office for long enough to release Joe Danger Infinity on iOS. 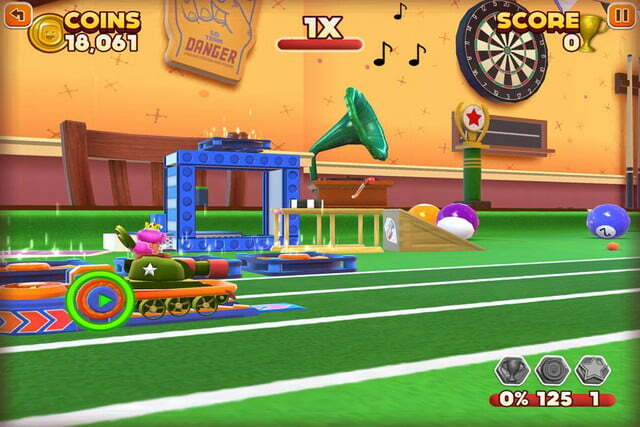 The new game builds on the great foundation established in 2013’s Joe Danger Touch. It’s a level-based affair, but the overall design is clearly inspired by mobile entertainment’s ever-popular “endless runner” genre. Joe’s motorbike follows a set left-to-right path at a constant speed while you swipe and tap to keep his journey safe and uninterrupted by obstacles. As with other games of this sort, the simple range of interactions becomes a complex juggling act once the training wheels come off. As with other games of this sort, the simple range of interactions becomes a complex juggling act once the training wheels come off. 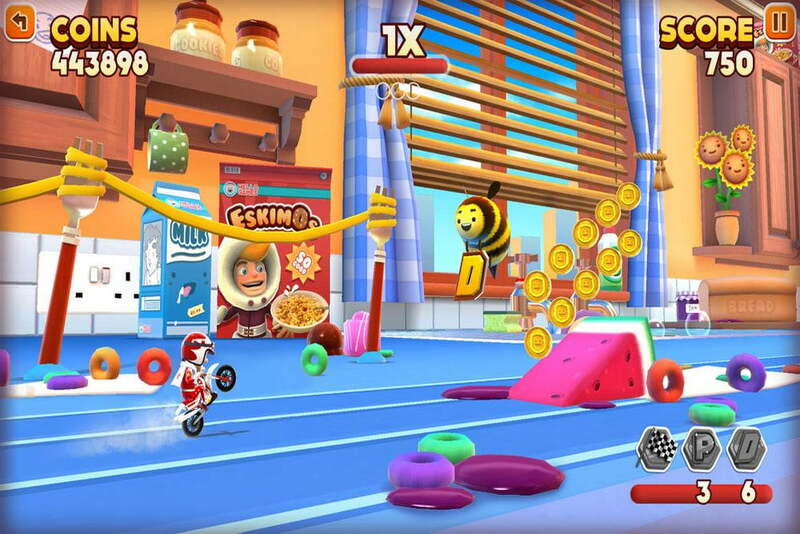 Joe Danger Infinity’s early levels amount to an extended tutorial, with each new level demonstrating a new feature, ability, or obstacle. Tedium is avoided thanks to the bite-sized level length; you’re never committed for more than a few minutes. Success in Joe Danger Infinity hinges heavily on watching and listening for audiovisual cues. The booming voice of the announcer chimes in to let you know when you need to jump, duck, spin, smash an obstacle, or any number of other maneuvers. Meanwhile, visual highlights appear around special tap-to-collect objects, like letters spelling out the word DANGER or gumball machine tokens that get you bonus coins and unlockable characters. The endless runner-like play meshes well with Infinity’s short, scripted levels. Early tutorial levels are a breeze, but the later sections require a mix of sharp reflexes and learning-via-repetition. If you’re a fan of the old-school grind in NES games like Mega Man, take note. This is your kind of game, minus the blocky pixels. There’s a gentle learning curve, but perfection requires memorization and pitch-perfect timing. Unfortunately, it’s not long before in-app purchases rear up to annoy you. Their mere presence isn’t a problem, but the fact that you’ve got to wade through a “HEY PLAYER DO YOU WANT TO BUY THIS STUFF?? 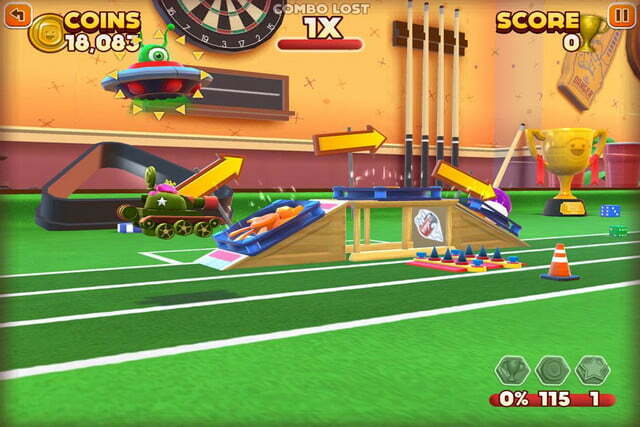 ?” pop-up every time you replay a level certainly is. There’s also no transparency in the game alerting you to how much these boosts cost (they’re $0.99 apiece). Tap to buy one and you’re simply presented with the App Store password prompt asking you to approve the purchase. Those that fear anything that could potentially be labeled as “cute” might be turned off, but really, WHAT KIND OF MONSTER ARE YOU? 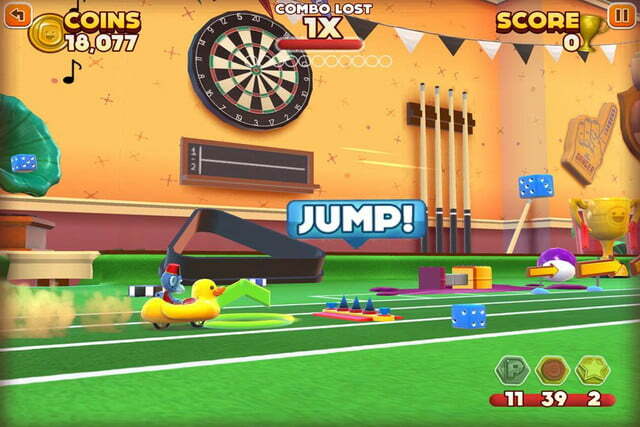 There’s nothing offensive about Joe Danger Infinity’s bright environments. They’re sometimes a little too busy, causing you to miss obstacles or pick-ups, but that’s also part of the old school charm. It’s best to just dip into your childhood toy time nostalgia and embrace the plastic fantastic-ness of it all. This game was reviewed on a 2013 iPad Mini using a copy of the game that was purchased by the author.